That’s my equation for Perfect Morning Coffee! Not that I am trying reduce making my perfect morning coffee to a science because it is really more of an art form. It’s also a journey seeking that “place” where all the necessary components come together to make a magic morning moment that gives your day a perfect start. The components might seem simple – the best drip coffee maker, a delightful flavored coffee ( Hazelnut is my flavor of choice), pure spring water, half and half cream – but they have to interact with the right timing, and proportions to produce that early morning cup of coffee perfection. Coffee starts my day, and a great cup can put me in a mood that makes whatever challenges thrown my way go so much easier. And a bad start to my morning coffee ritual can put me in a negative mindset that is hard for me to shake for the rest of the day. I’m talking a bad start like finding that I am out of cream and have to use milk ( I just can’t get my self to drink black coffee) or finding I am out of my favorite flavored drip coffee and have to use that “emergency” jar of instant coffee ( it’s better than “no coffee” but as close to “no coffee” as you can get). My day begins with a cup of coffee while I plan my day. When the weather permits, I spend this quiet moment on the front porch enjoying our view of Mt. Katahdin and the Maine wilderness. I’m an early riser, up and out of bed between 5 & 6 AM. Everyone else, except for my cat Chuckles, is sound asleep so this is MY TIME! I programmed my drip coffee maker the night before so a fresh pot of coffee is waiting for me. 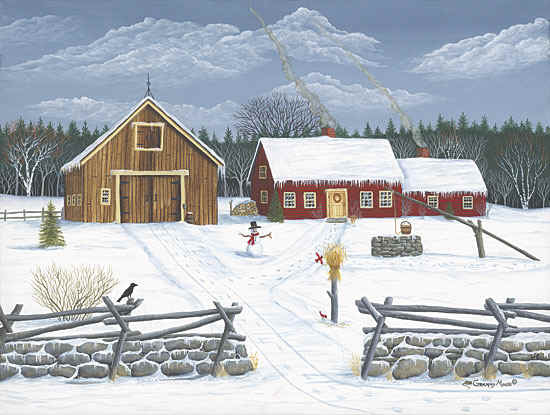 This time of year I take my morning cup of coffee and head for the front porch where I savor that steaming coffee deliciousness as I look out across the valley as the rising sun illuminates Mount Katahdin. It is said that the summit of Mount Katahdin is the first place that the sun’s light touches the United States each morning. It’s the perfect time to read my Bible as I sip my coffee and when I am done reading, I plan out my day. And all this is completed before the rest of the family starts demanding my full attention. Blogging is a solitary profession….just a mom and her computer. The blogging friends that I make on the Internet gives me the opportunity to have a morning coffee break with friends in a Google Hangout. Coffee is my “buddy” through the day. 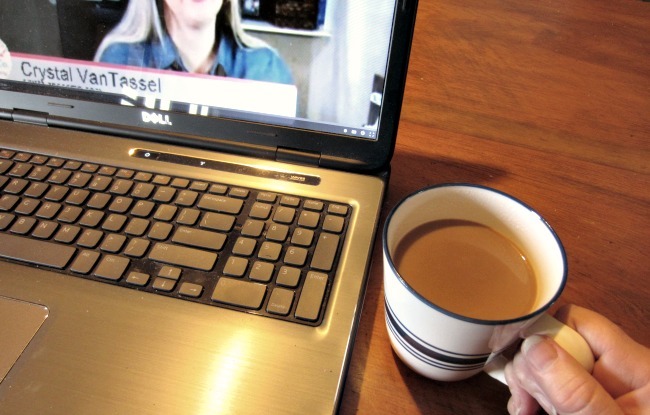 In the solitary world of blogging, grabbing a cup of coffee and settling into a Skype session with my blog tribe or attending a Google hangout with some fellow Mom bloggers is the closest thing I can get to the proverbial “office water cooler” chat. The final cup of coffee for the day that Bill & I share while having our dessert. 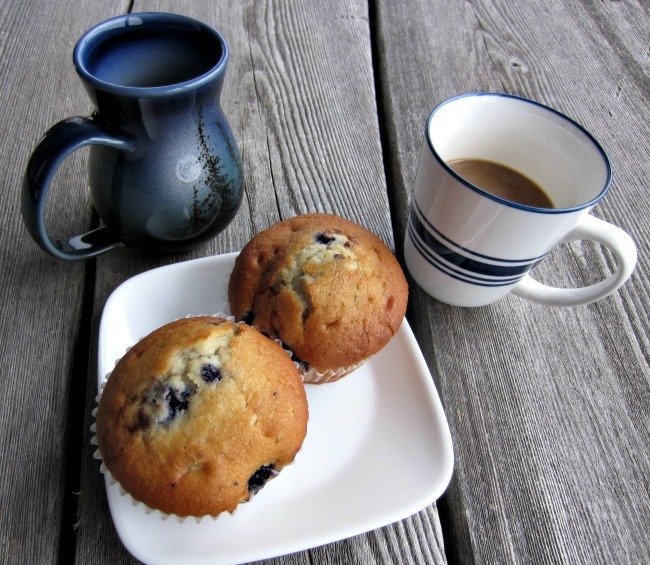 On tonight’s desert menu – Maine Blueberry muffins. Yum! After supper is done, the kitchen is cleaned, and the dishwasher is humming through its wash cycle, I can set down with Bill and enjoy our evening dessert with a final cup of coffee for the day. It’s our special time for us when we can fill each other in on the happenings of our day. Last week my coffee maker started making strange noises, and the brew was less than optimal so when I was contacted by #CollectiveBias to do this sponsored post for Mr. Coffee® and Millstone® coffee, it couldn’t have happened at a better time. The assignment – to head out to Walmart and purchase 2 Mr. Coffee® 10 Cup Optimal Brew™ Thermal Coffee Makers and 2 packages of Millstone® coffee. Why 2 of each you ask? Two so that I can play “Santa” and give a coffee maker and coffee to one of you, my dear readers! How sweet is that! So it was off to Walmart to make my purchases. Wow! 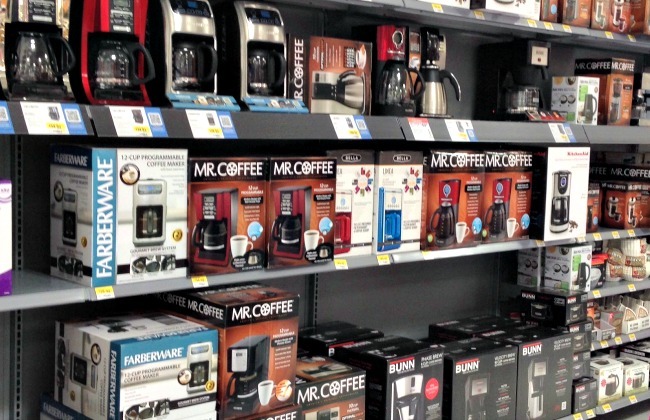 What a wonderful selection of coffee makers at Walmart, but after studying the details listed on the box, I am excited about this Mr. Coffee® 10 Cup Optimal Brew™ Thermal Coffee Maker! The Mr. Coffee® Optimal Brew™ Coffee Maker was easy to find, and I love the features denoted on the box. Features like the Auto Shut-Off eliminate my racking my brain 2 miles from the house as to whether I remembered to turn the coffee maker off. The removable filter basket and the removable water reservoir make for easy cleaning, and along with the water filtration will help with unwanted mineral build up. We have “hard” water and mineral build up can be a huge problem with appliances. 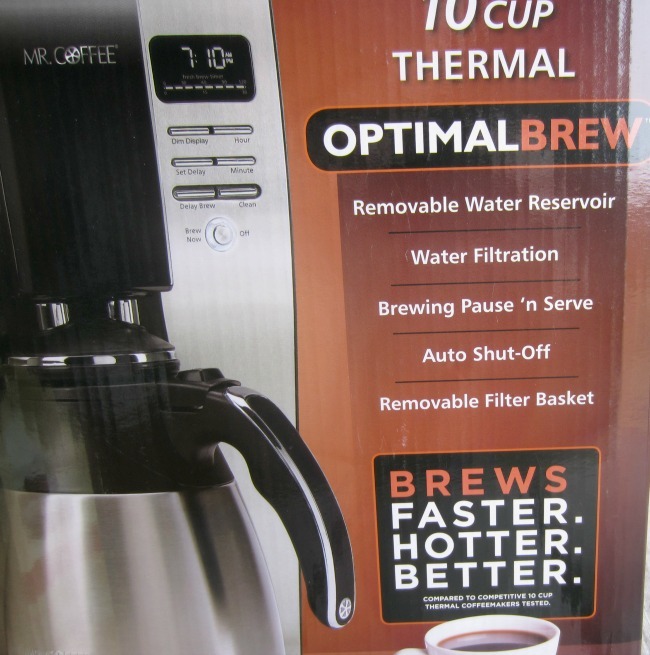 I was one happy camper when I saw this list of features on the box….and who can beat “Brews faster, hotter, better”. Love you, Mr. Coffee®! 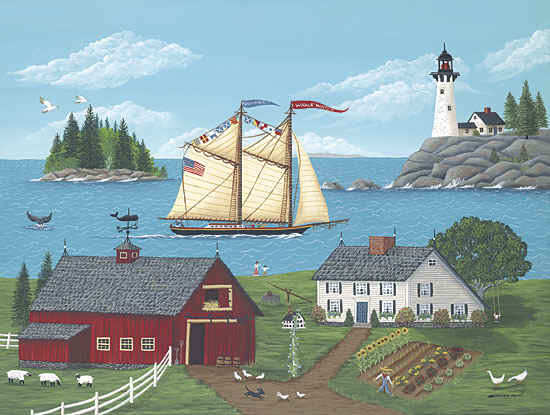 Now the Millstone® coffee was another ordeal! I found it quick enough but which to choose? The selection was great and almost overwhelming, but of course, I love Hazelnut so that choice for my coffee was easy. But what about the coffee for you? Hazelnut, hmm, what if you don’t like Hazelnut. OK, so I will go with an unflavored coffee, but decaf or regular? Decisions, decisions! I decided that Kona Blend would be the best choice. If the winner liked flavored coffee they could always get a flavored creamer. 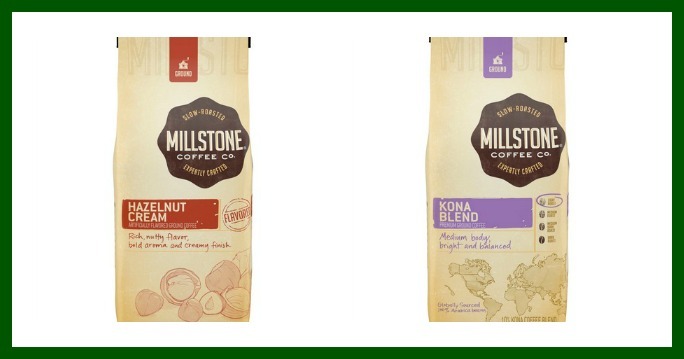 As I perused the package of Millstone® coffee, I was pleased to see that Millstone® uses 100% Arabica Coffee beans from the very best sources. Coffee’s production is fascinating and the more you learn about the coffee process from growing to the finished product on your store shelf, the more you appreciate that cup of roasted goodness. 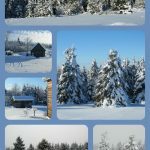 Millstone® has an informative website where they relate the Millstone® Beans Journey with gorgeous pictures. Be sure to visit as it is really well done and would be a great resource for the kids doing a geography report for school. 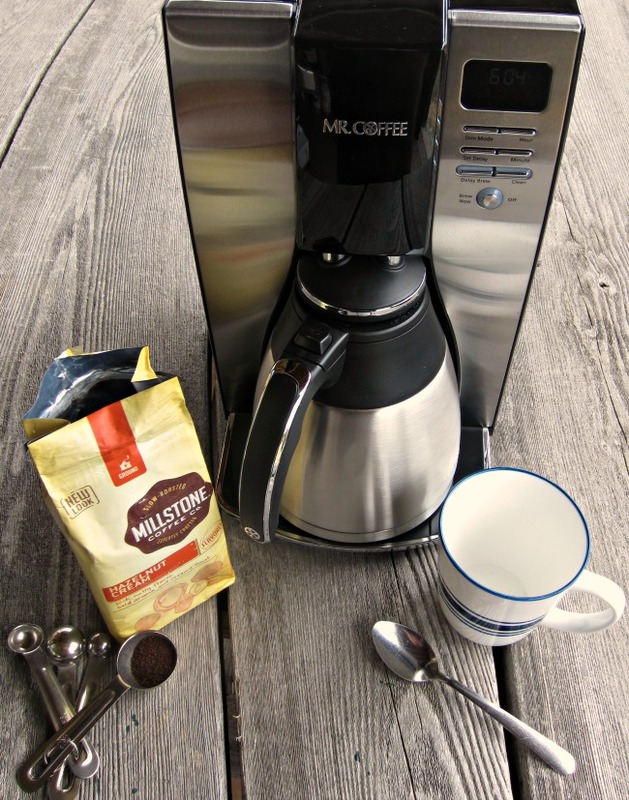 So I headed home to set things up for my first cup of Millstone®coffee with my new Mr.Coffee® coffee maker. The instructions were great and in no time I had the first pot perking. I really like feature of the water filtration system which allows you to keep track of when you need to change the filter. Living in the country, we get our water from our own well and it is very heavily mineralized so filtering is important to me. It also has a cleaning cycle that gets rid of calcium deposits. Both are great features for us! 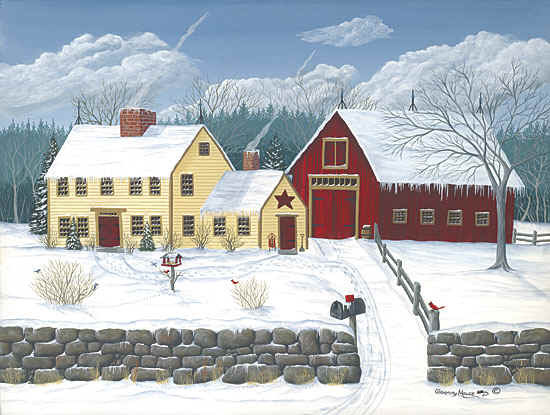 Now to the Millstone® Coffee! 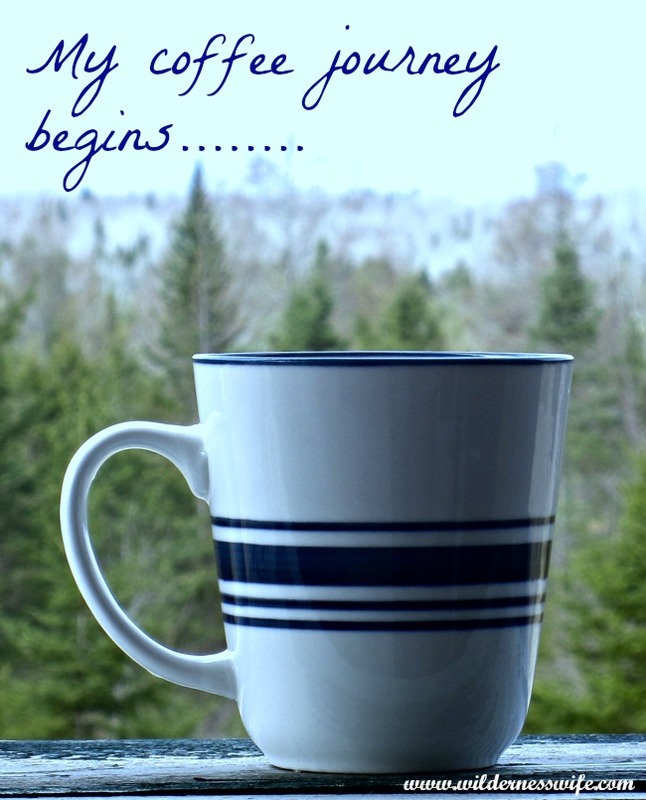 Waiting for that first sip,,,,the aroma of the rich Arabica coffee is so tantalizing! Yum! This going to be a good morning. As I open the bag, the rich coffee aroma is tantalizing. I’m an artist and a foodie so for me coffee is a wonderful sensual experience – the aroma, the color, the delicious smoothness as it caresses my taste buds. Ooops, I’d better be careful here as this is beginning to sound more like “50 Shades of Gray” instead of a woman drinking her coffee. But that is how much I enjoy coffee, from the first cup in the morning to that mid-morning pick-me-up to that last cup of the day with dessert after a satisfying meal. Now here is your chance to share my experience by entering this giveaway so you can enjoy that perfect cup of coffee goodness. Being I get up early, set my Mr. Coffee brewer so it is brewed & waiting for me, and then sit to read & blog, this is now my favorite giveaway I have ever entered 🙂 I visited from Thurs. Favorite things & boy am I glad! You are my kind of girl. I have morning coffee rituals also, and I am seriously in trouble when I am out of cream or my favorite coffee flavoring. Thanks so much for sharing with Wednesday’s Adorned From Above Link Party. potentially eye opening giveaway lol 🙂 pinning to share!